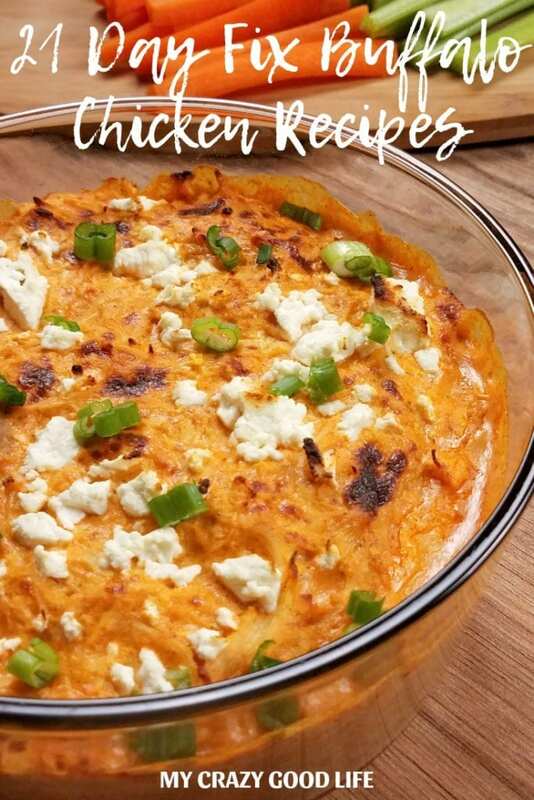 These 21 Day Fix Buffalo Chicken recipes are delicious and can stop cravings in a second! Buffalo sauce is my favorite, and I love that it’s so easy to lighten up! Buffalo chicken dip, Buffalo Chicken Chili, Buffalo Mac and Cheese…all of your favorites, but FIXED! Buffalo chicken recipes are the best! They’re great for a meal or as an appetizer for parties and gatherings. 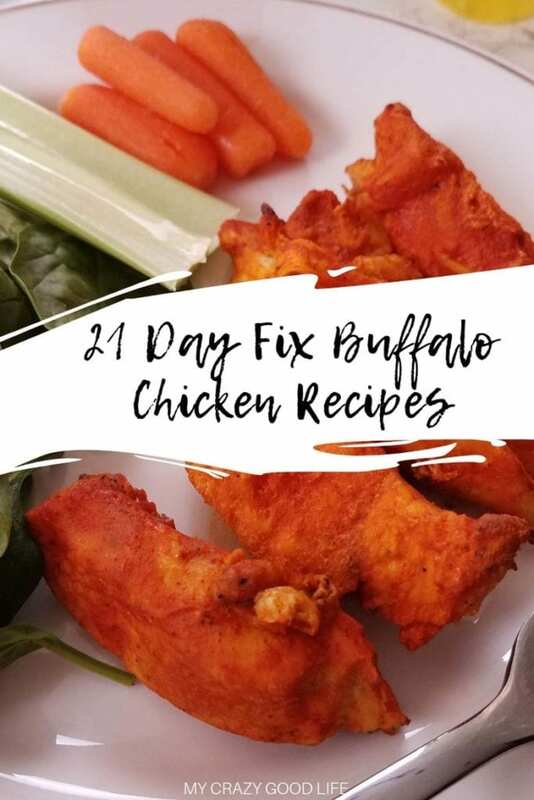 These 21 Day Fix buffalo chicken recipes are not only delicious, they’re also clean, healthy, and easy to make. I’ve divided these tasty buffalo chicken recipes up into sections so you know exactly what you’re getting. 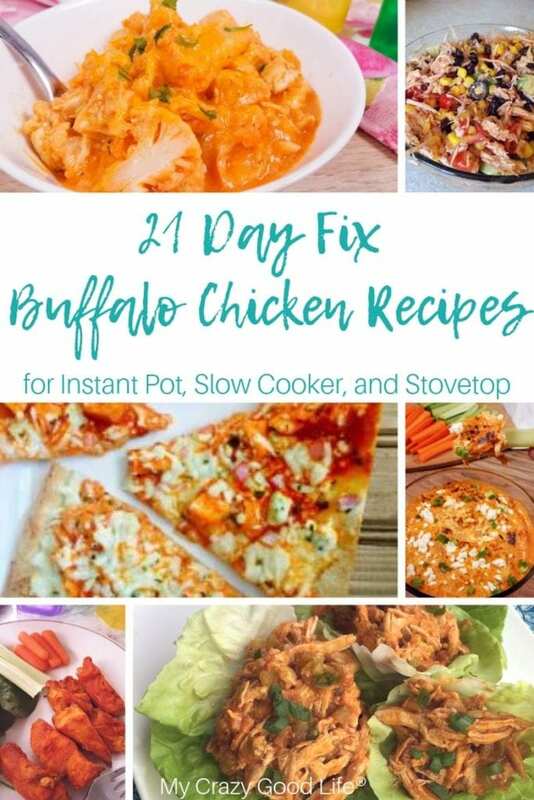 Where can I find some Instant Pot buffalo chicken recipes? 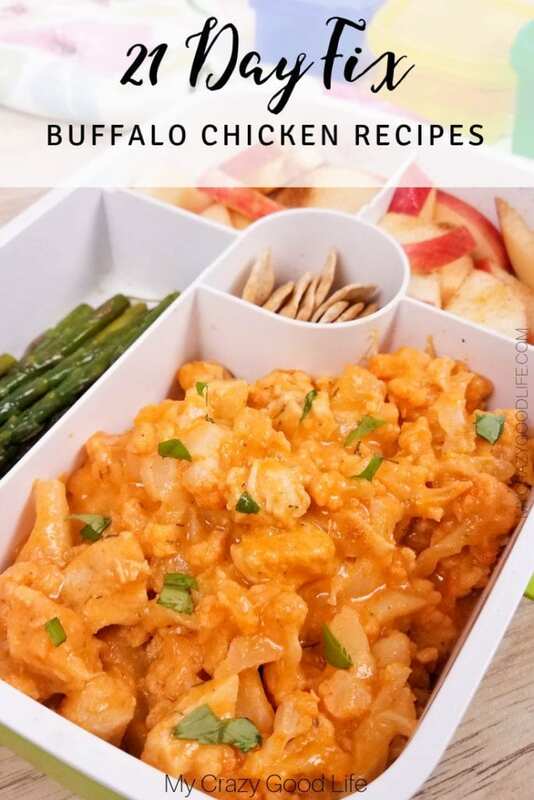 Healthy Buffalo Chicken Dip | This buffalo chicken dip is healthy, easy, and super tasty served up with fresh veggies! Buffalo Cauliflower Mac And Cheese | Thanks to the cauliflower this buffalo mac and cheese is lighter but still just as delicious! Instant Pot 21 Day Fix Buffalo Chicken Bites | We eat these all the time! They’re great for a snack or lunch. They go great on top of a salad as well! Buffalo Chicken Chili | Confessions of a Fit Foodie | There’s never a bad time for chili. This buffalo chicken chili makes an excellent meal prep and with the Instant Pot it’s super quick and easy. Do you have any slow cooker buffalo chicken recipes? The top two recipes above also have slow cooker instructions. *Buffalo Chicken Bowl | The Colbert Clan | Simple and fresh flavors all bundled up together in this buffalo chicken bowls will make the whole family happy! *Note: The packet of dressing she uses in this recipe is not approved. You can make your own using this recipe. *Easy Buffalo Chicken Pockets | Crystal P Fitness and Food | Looking for a tasty recipe that travels well? Try these easy buffalo chicken pockets. *Note: She mentions using Frank’s Buffalo sauce, and that is not approved. Use Frank’s original to stay on track with your weight loss! Are there buffalo chicken recipes I can make on the stovetop? Buffalo Chicken Lettuce Wraps | Carrie Elle | If you’re looking for low carb options you won’t want to skip these buffalo chicken lettuce wraps. They’re fresh, tasty, and perfect for lunch! Cajun Chicken Alfredo | Healthy Alfredo Sauce Recipe | Here’s a little twist on buffalo chicken that’s more cajun than buffalo but still packs a kick! Give it a try with this creamy Alfredo pasta. Any healthy buffalo chicken recipes that I can bake in the oven? Buffalo Chicken Pizza | Confessions of a Fit Foodie | Who doesn’t love pizza, right? Well this buffalo chicken pizza is the best of all the worlds. It’s light, 21 Day Fix approved, and perfect for those days when a craving strike! Baked Buffalo Shrimp | Confessions of a Fit Foodie | Okay, so these don’t have chicken in them…but they’re equally satisfying. Buffalo Ranch Chicken Stuffed Peppers | Taylor Nichols | If you like stuffed peppers you definitely want to give these buffalo chicken ones a try! Buffalo Chicken Meal Prep | Rachel Reaches | If you like to meal prep this is the buffalo chicken recipe for you. Are all of these buffalo chicken recipes 21 Day Fix approved? Yes! All of these recipes have your 21 Day Fix counts already included. You can whip them up with no stress about how to count them, no matter which bracket you’re in. Do you have other 21 Day Fix resources? Yes! Here are some other 21 Day Fix resources you can check out!